Taylor of Old Bond Street shaving gift set contains a handmade Pure badger hair shaving brush and Taylor's sandalwood shaving cream tub in a presentation box. The box is slightly damaged at one corner, the contents are in perfect condition. Taylor's sandalwood shaving cram is one of the top selling shaving creams, loved by men of all ages. The rich lather protects and moisturises while you shave. Lathering with the brush gives perfect results. Taylor's Sandalwood Shaving Cream (150g): Formulated without parabens, making it suitable for sensitive skin. Traditional masculine fragrance of sweet scented sandalwood and cedarwood. The cream provides a rich cream that facilitates a close smooth and comfortable shave. A little goes a long way with this luxury cream. Pure Badger Hair Shaving Brush: Helps to produce a smooth, creamy lather and will lift the hairs from the face making for a more comfortable shave. 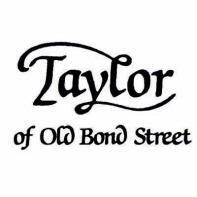 The brush is branded 'Taylor of Old Bond Street, London England. Pure Badger Handmade in England'. Great value, bargain being reduced because the box is slightly damaged. Cream: Aqua, Stearic Acid, Myristic Acid, Potassium Hydroxide, Coconut Acid, Glycerin, Parfum, Triethanolamine, Sodium Hydroxide, Methylchloroisothiazolinone, Methylisothiazolinon Brush: Pure grade badger hair set in a high quality resin handle.